cardigans and kids: cake. specifically, white cake (recipe included). cake. 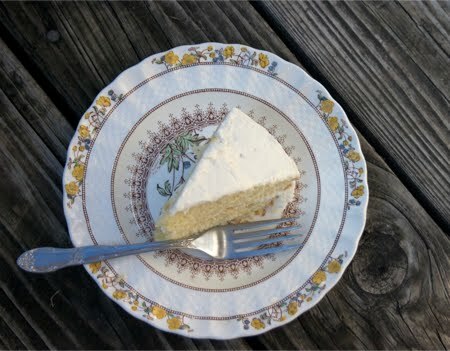 specifically, white cake (recipe included). I first attempted baking cake from scratch when Alli was probably 3? Until then I was a cake mix kind of gal. Lots of colored frosting and boxed cake mixes. Now, as I mentioned previously - we have had some pretty fun cakes thanks to lots of frosting made with shortening and those boxed cakes, but I was ready for a homemade cake. I remember eating the first cake I made with the recipe from my "Betty Crocker cookbook" and being so thankful that there was ice cream to hide the taste of my homemade cake. It was not what I was hoping for, and from that birthday on, I have searched for the "perfect" white cake. 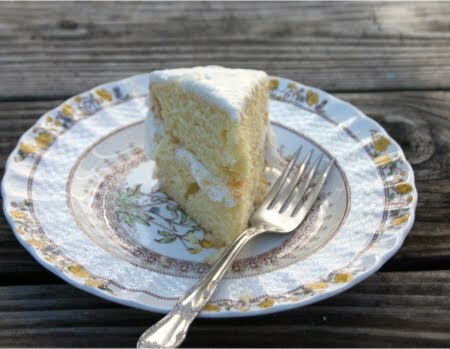 I have to admit that the "White Out Cake" in "Baked Explorations" is my favorite. I love the texture and the white chocolate butter cream frosting between all those layers. However, I don't always have the time for the White Out Cake, so when I need another birthday cake with a time crunch. This is my favorite, and it only requires one bowl for mixing*. adapted from "Apples for Jam"
Preheat oven to 325 degrees F. Butter two 8 in. cake pans. Beat the butter and sugar together for 2-3 minutes. Add the vanilla, beating once again. And then either sift in the flour, baking powder and salt (*or mix them together in a separate bowl and add to the batter). Beat well, and then slowly add in the milk a little at a time. The batter is thick and creamy - similar to a pound cake. Pour into both the cake pans. Bake for 35-40 minutes. When you insert a toothpick into the center, it should come out clean. Cool on wire racks for 10 minutes. Loosen the sides and remove from the cake plates, leaving on wire racks until cool. I made a butter cream frosting found at savory sweet life. Beat the butter on medium speed for 3 minutes. Add 3 c. powdered sugar and beat on low until the powdered sugar is mixed in, add the remaining ingredients. I used just two for a easy to spread consistency for frosting the cake. If I would have piped the frosting on, I would have still used two, but added a bit more powdered sugar to thicken it up a bit. Frost and serve. No ice cream necessary, but coffee goes with it quite nicely.